Feeling the need to go somewhere different to our usual haunts, Mrs. SF and I and a couple of friends and their daughter decided a trip out to one of Cardiff’s suburbs (hence the reference in the title to the “burbs”) was in order. 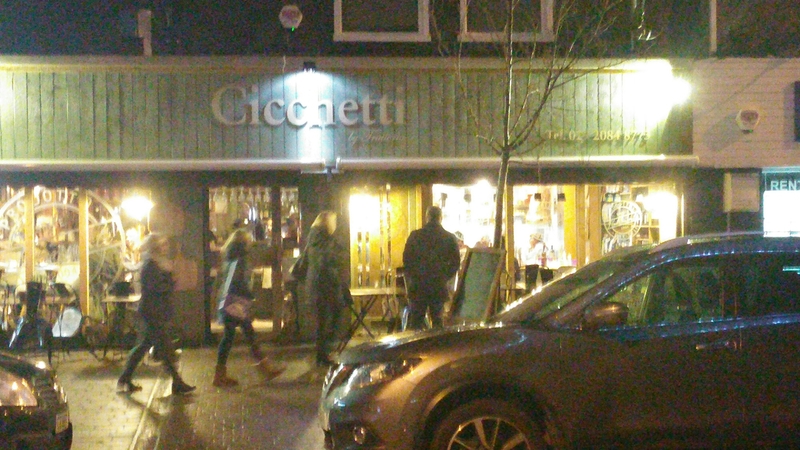 After a bit of a think re logistics and dietary preferences (friend’s daughter being somewhat selective in terms of what she will eat) we settled on Cicchetti in Radyr, Radyr being a short hop from a train station not too far from our respective houses and said daughter being prepared to eat pizza. Due to a combination of train times and not being able to find a pub in close enough proximity to Cicchetti to enable a quick pre meal drink (where are the pubs – actually one would have sufficed – in Radyr), we arrived a good 25 minutes early (it was either than or loiter suspiciously for 20 minutes in the Spar). 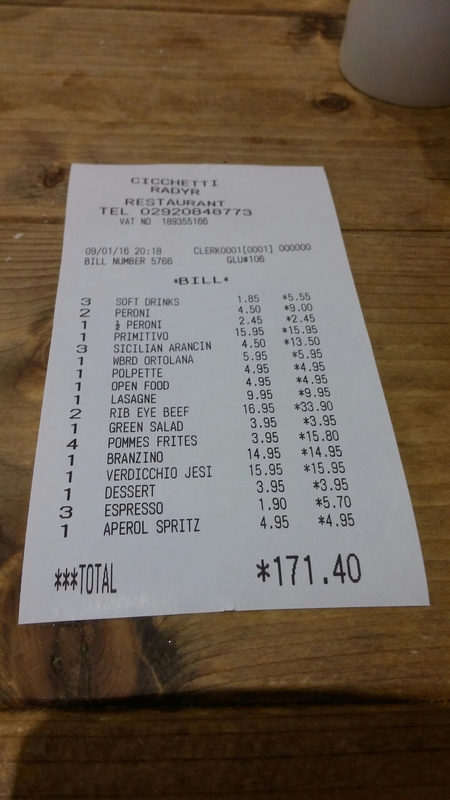 This was managed with good grace by the staff, with us occupying the rather tiny bar area for only about 10 minutes – a pint of Peroni going down a treat during the hiatus – before being seated. 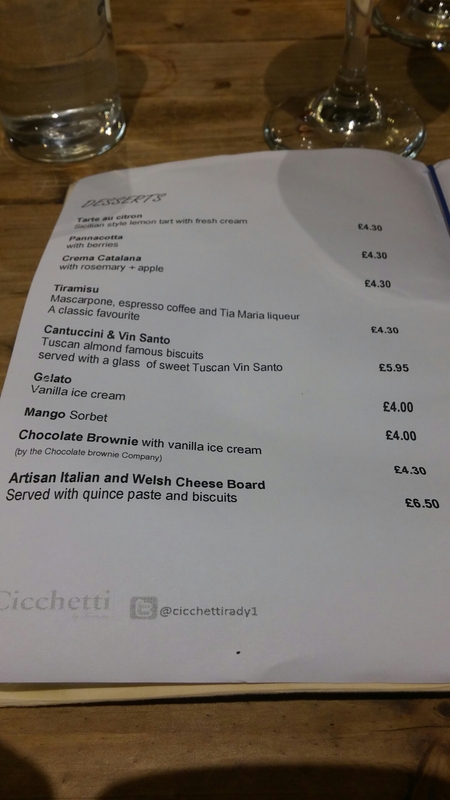 Deli by day, Italian diner by night (they actually serve food all day) Cicchetti has a rather charming rustic feel to it. 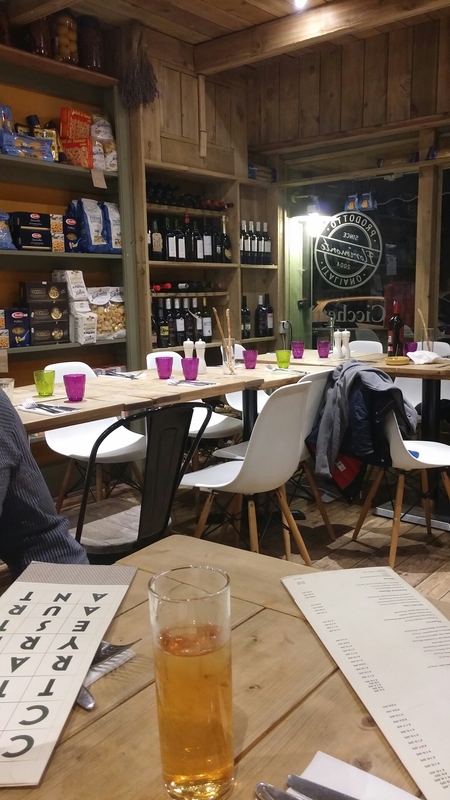 We ate on a table with cans of tomatos and rather fine tins of anchovies behind us, the deli counter to our left and shelves of olive oils, pasta and wine to our front. They do, at least on the night of our visit, seem to jam you in a bit so not perhaps a spot for a romantic dinner for two. 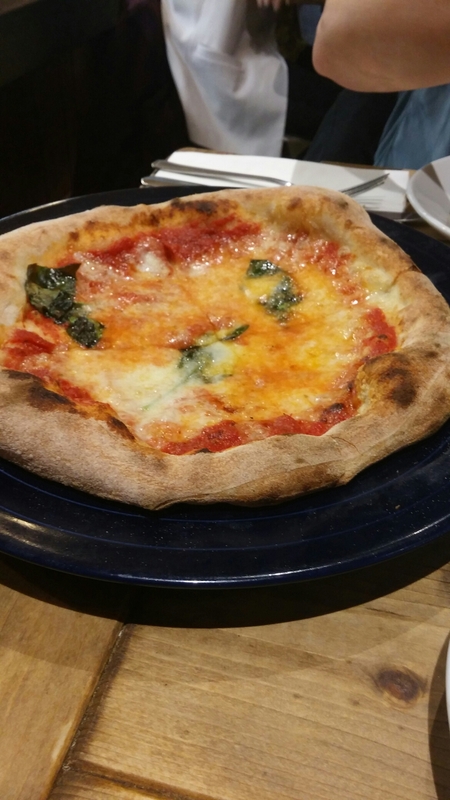 A couple across from us barely had room on their table for the rather large calzone and pizza they ordered and seemed to be regularly banging elbows in tackling their food. This may have been down to how busy it was the night in question. Packed out in early January is not bad. Maybe because it was busy it was also a bit on the hot side inside. 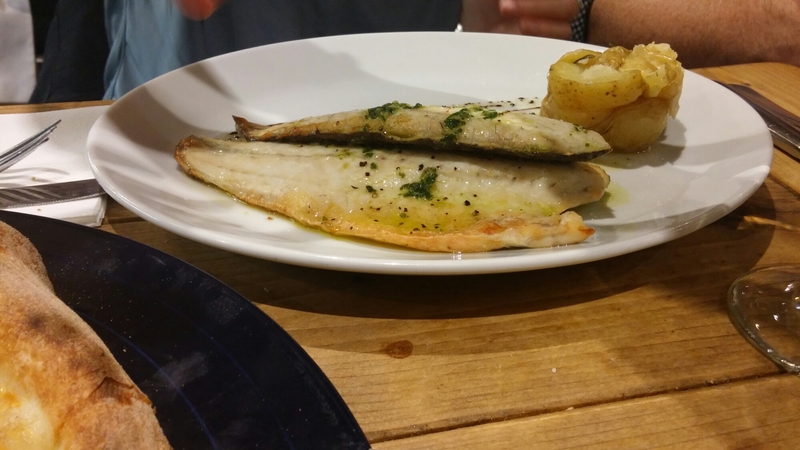 and traditional fish and meat mains. 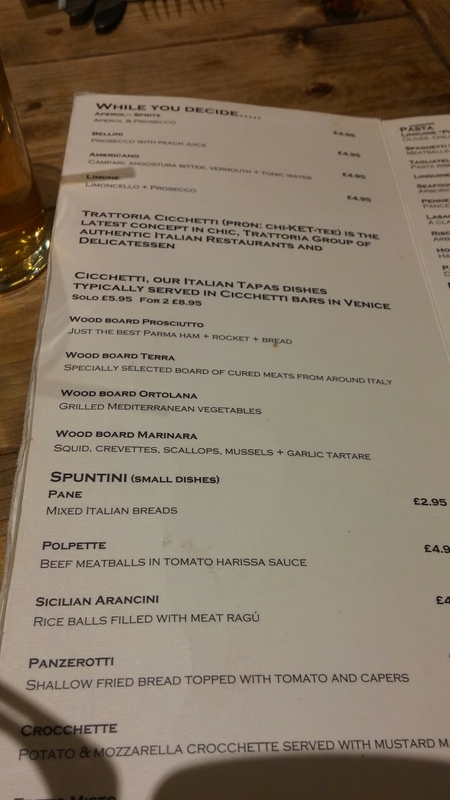 I imagine that at lunch time the cicchetti and spuntini work like tapas/pintxos with the idea being to order a few to share, whereas in the evening they are more like starters. 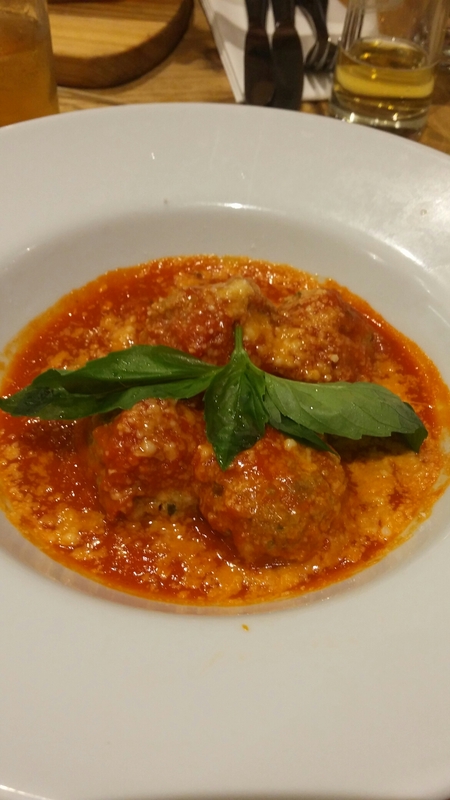 All very nice, with the star of the show the rich tomato harissa sauce that the polpette bathed in. 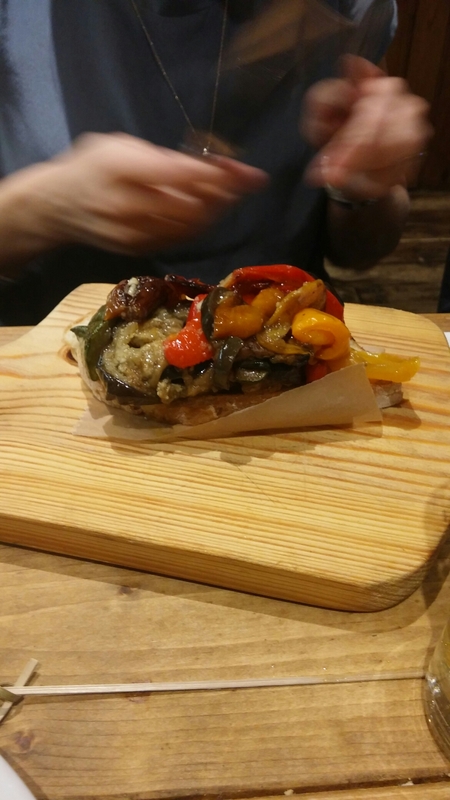 Be warned these small plates are bigger than you expect and quite filling, so don’t order too many. Three of these between the four adults and one child would have been fine for us. Good value I thought. 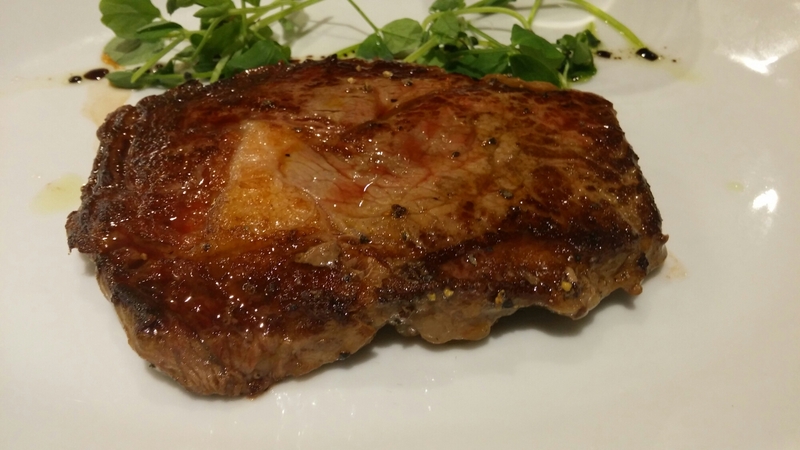 My gripe with the steak was the size did not warrant the nigh on £17 price tag. I would be surprise if it was more than six ounces (it was cut quite thin) and to me it should have been bigger or the price lighter. 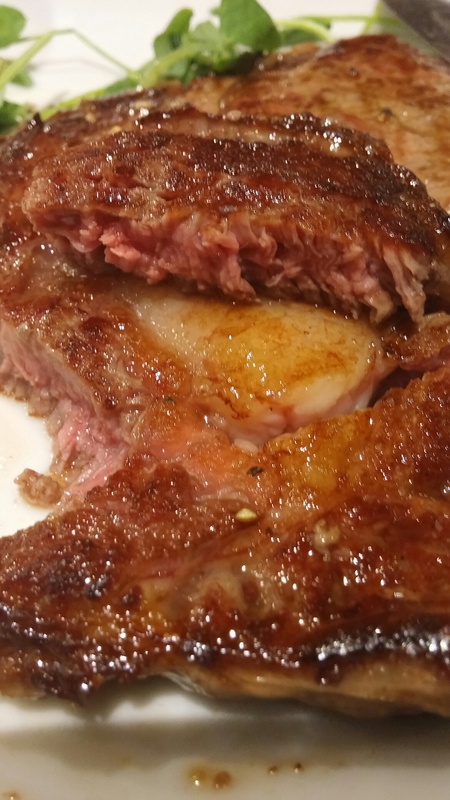 Serves me right for being boring and ordering the steak, I suppose. There was an element of confusion in terms of what came with the mains. The menu was silent on the issue, so we asked the waitress. Our collective understanding of the response we got was that no veg. was included in the main’s price so we ordered fries and a green salad. At no point was this questioned and then lo and behold a plate of veg. (albeit rather a small amount for four adult) arrived. Slightly annoying but no biggie. We will know next time but this should have been clearer (especially as we asked). 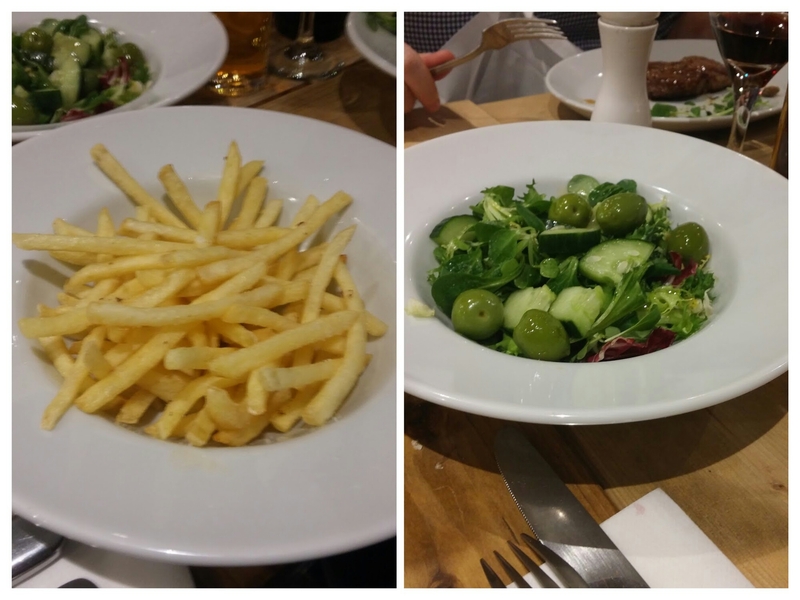 We all, bar one, skipped on pudding, having gorged on fries, salad and veg with the mains. 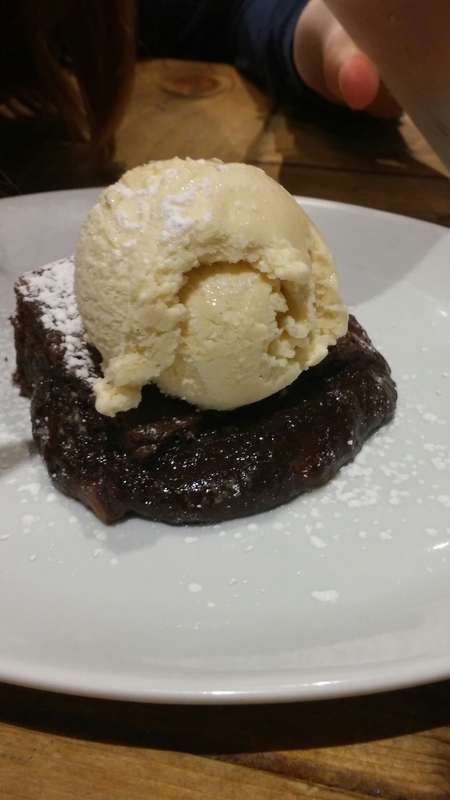 The one pudding ordered was a brownie which had a nice gooeyness to it, but a somewhat pedestrian ice cream accompaniment (from the small bit I was allowed). 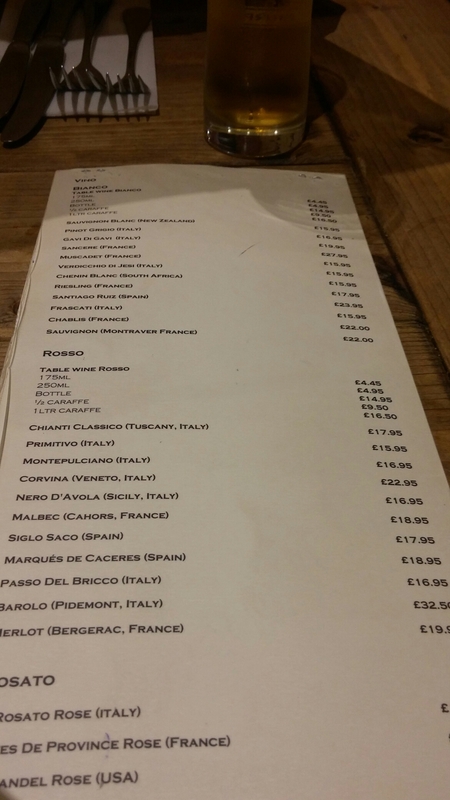 On the booze front they have a couple of Italian beers and an Italian focused wine list. The list is short on detail with no vintages or descriptions for the wines, but prices are not bad. 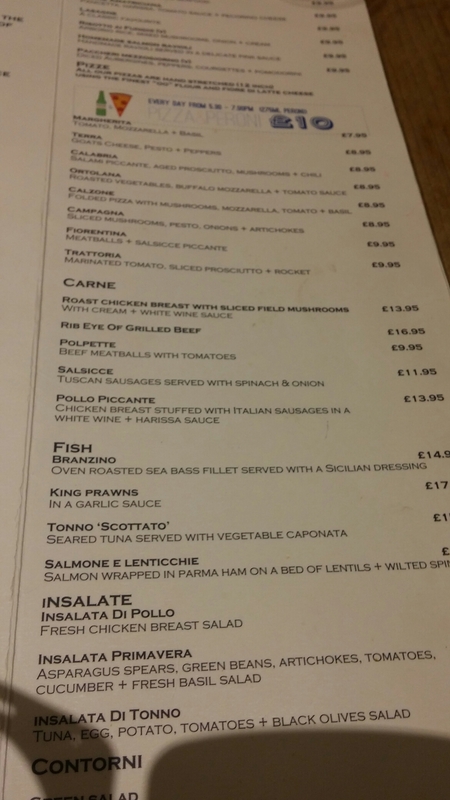 Personally I think a bit more detail would help as not everyone may be au fait with the Italian wine on the list. I suspect a lot of people may be unfamilar with Corvina (a grape grown in the Veneto area used in light fruity red wines such as Valpolicella) or Nero d’Avola (from Sicily and synonymous with quite dense and dark wines). A little bit of guidance as to what to expect would be helpful here. 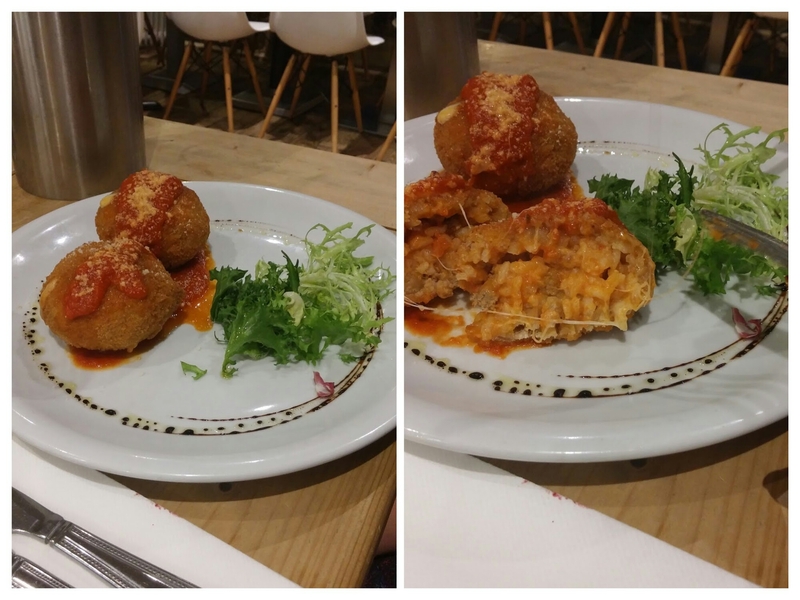 We opted for what was described on the menu as a Puglian Primitivo (red) on the face of it for a very reasonable £15.95 and a Verdicchio dei Castelli di Jesus (white) (£15.95). 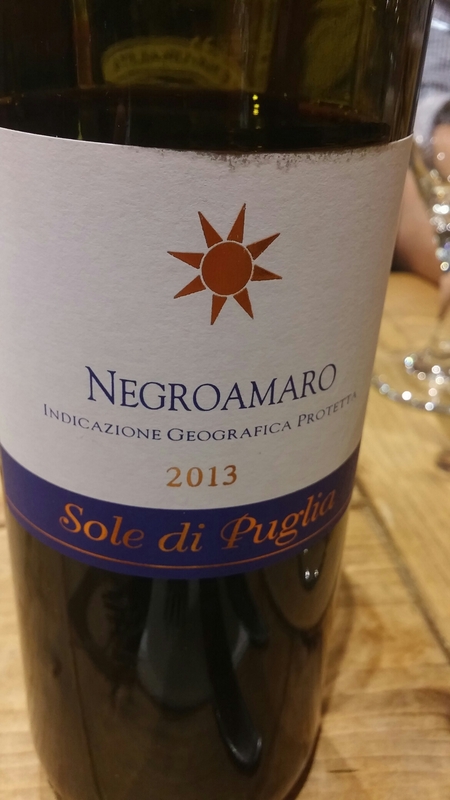 The red that turned up was a touch on the warm side (not regrettably that unusual in UK restaurants and bars, but cured by popping it in a wine cooler ) and was a Negroamaro Sole di Puglia (a wine made predominately using its namesake Negroamaro grape rather than the advertised Primitivo grape). We thought about raising this but the wine we got was actually OK for the price paid so we let it go. The white was a fairly bog standard affair – dry and fairly neutral. 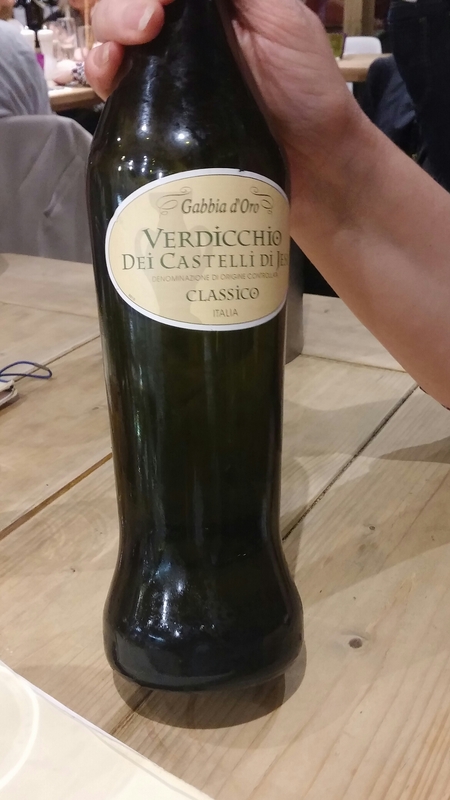 Not the best example of a Verdicchio but OK for the price. 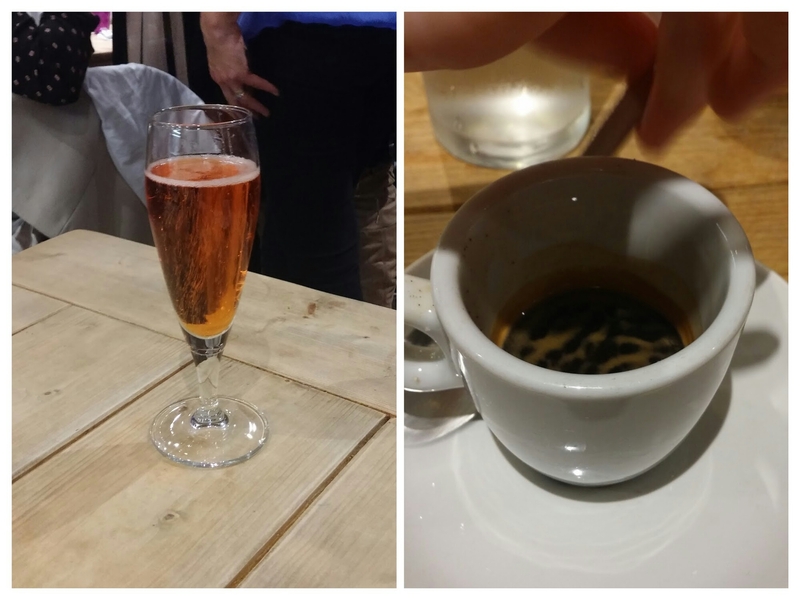 Notwithstanding a couple of issues (overpriced/undersized steak, the red wine and veg mix ups), we all enjoyed our visit to Cicchetti. 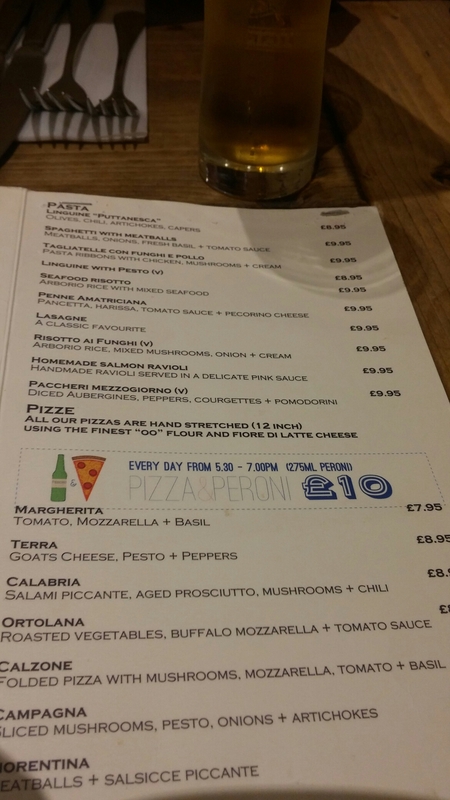 A solid Italian in the Cardiff burbs and a credible alternative to my local Italian – ish restaurant in Llandaf, Porro. 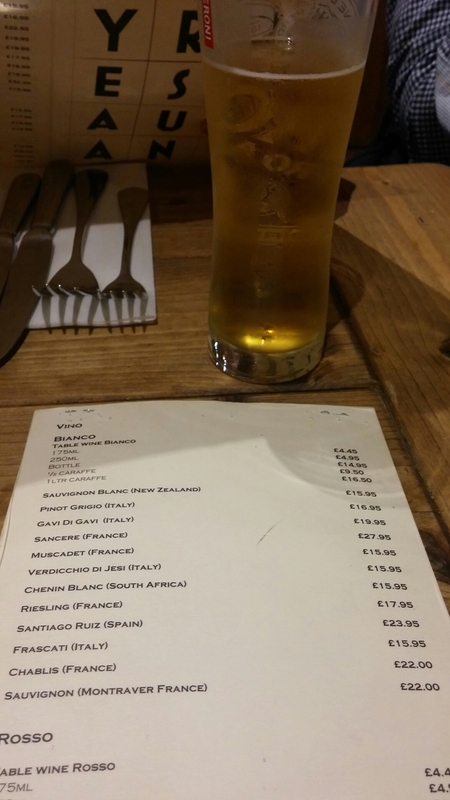 OK, if not brilliant, value I would say but we did somewhat over order and were quite heavy on the booze front. They use their Facebook page as a website. 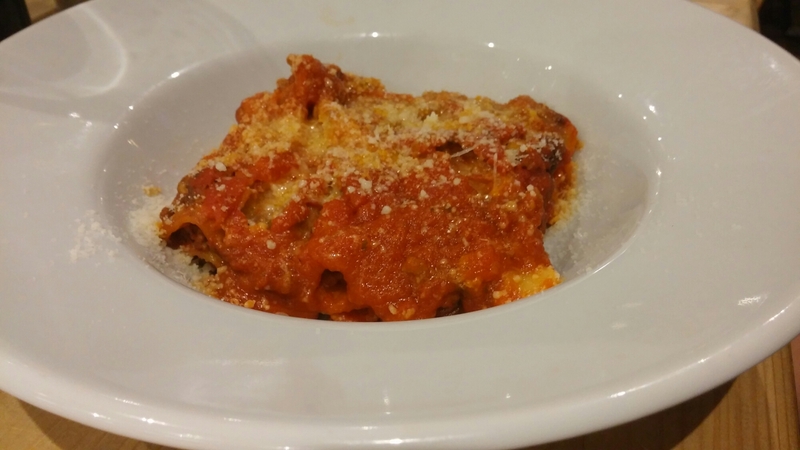 This entry was posted on Jan 24, 2016 by solicitingflavours in Beer, bistro, Cafe, Cardiff, charcuturie, cheese, Cicchetti, coffee, Drink, Dry white wine, Food, Food and wine products, italian, Italian wine, Italy, pasta, pizza, Porro, Raydr, Red Wine, Restaurant Review, retail, review, Takeaway, Uncategorized, Wales, White wine, wine.